The BEST French Toast Recipe! It Is easy to make at home and the perfect breakfast for weekends or any day! 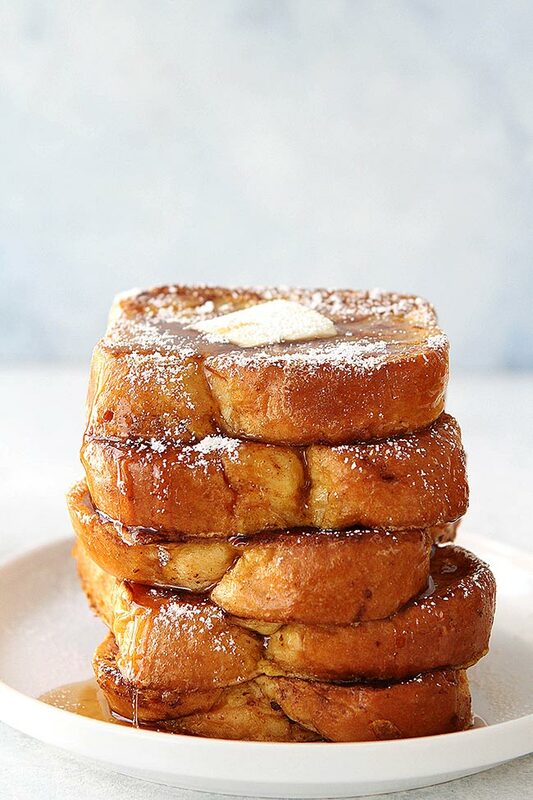 Serve this light and fluffy french toast with butter, maple syrup, and powdered sugar. French toast has always been my favorite breakfast. If I have a choice between pancakes, waffles, or French toast, I always pick French toast, especially this Classic French Toast. It is the BEST French toast and today I am sharing all of my tips for making perfect French toast. Don’t worry, it is SO simple, but SO good! And the best part? You don’t have to leave your house. Sure, I love going out for breakfast, but I would much rather stay in my pj’s and eat a delicious breakfast at home. Homemade French toast is always better, trust me. After you make my French toast recipe, you will be a French toast fan for life. Brioche bread is hands down the best bread for French toast, in my opinion. It is rich, buttery, fluffy, and makes the most amazing French toast. It is definitely a very indulgent bread, but SO worth it! If you want the best French toast, you have to start with the best bread! You can find brioche at most bakeries and some grocery stores carry brioche too. Trader Joe’s sells sliced brioche bread and it is GOOD, our very favorite! If you can’t find brioche bread, you can use Texas toast, Challah, or French bread. They are all good French toast options. 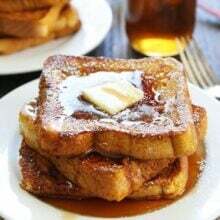 Day old bread or stale bread is actually better for French toast because it will soak up the French toast batter better. So if you know you are going to make French toast, buy your bread a day or two in advance. And did you know that the French don’t even call French toast, French toast, it is “pain perdu,” which means lost bread because they use stale, aka “lost” bread. Mix the batter in a shallow pan or pie pan. I mix the batter right in the pan so I don’t have to dirty another dish. You can use a whisk or fork to mix the batter together. Make sure the eggs and milk are thoroughly beaten together. Do not skip the vanilla and cinnamon, these two ingredients are essential for making the best French toast. They add so much flavor to the bread. Pro tip-add half of the cinnamon and mix it in. When you have cooked half of your French toast, add the rest of the cinnamon. This will make sure all of the French toast pieces have a good amount of cinnamon and not just the first few pieces. 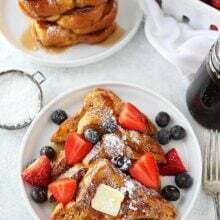 We use whole milk to make this French toast recipe because the higher fat content makes the French toast nice and creamy. but you can substitute heavy cream, almond milk, or even coconut milk. The flavors will change a little, but the French toast will still be delicious! Heavy Cream-use heavy cream for an extra decadent French toast. You can also use half milk and half heavy cream. Almond Milk-unsweetened vanilla almond milk makes great French toast. I love the extra vanilla flavor. Coconut Milk –coconut milk actually makes amazing French toast. I love the rich coconut flavor. You can use an electric griddle or skillet on the stove to make the French toast. We like to use an electric griddle because we can cook several pieces at the same time. Make sure the griddle or skillet is nice and hot before you start cooking the French toast. Make sure you soak each side of the bread in the French toast batter. You want both sides of the bread to soak up all of the egg mixture. Don’t leave the bread in the mixture too long or it will get soggy. You can use a spatula, fork, or tongs to flip the bread in the French toast batter. Cook the French toast in butter. It will give the French toast extra flavor and create a nice golden brown crust. Place a little butter on the hot griddle or pan and let it melt. Place the soaked pieces of bread onto the hot, buttery pan. Cook the French toast on both sides until golden brown, about 2-3 minutes per side. You can keep your French toast warm in a 200 degree F oven for up to 30 minutes. Place a wire rack on a large baking sheet and place the French toast slices on the rack. Don’t leave the French toast in the oven for too long or it will dry out. French toast is best served fresh and hot! You can freeze French toast. Arrange slices in a single layer on a baking sheet to freeze, and then transfer to a freezer bag and freeze for up to two months. To reheat, place the French toast slices in the toaster and toast! You can reheat the French toast in the microwave, but I think it makes the bread a little soggy. I prefer the toaster. The French toast doesn’t need much more, but if you want to go all out you can add a dollop of whipped cream, sliced almonds, candied pecans, a sprinkling of granola, nut butter, banana slices, jam, or even a little Nutella. 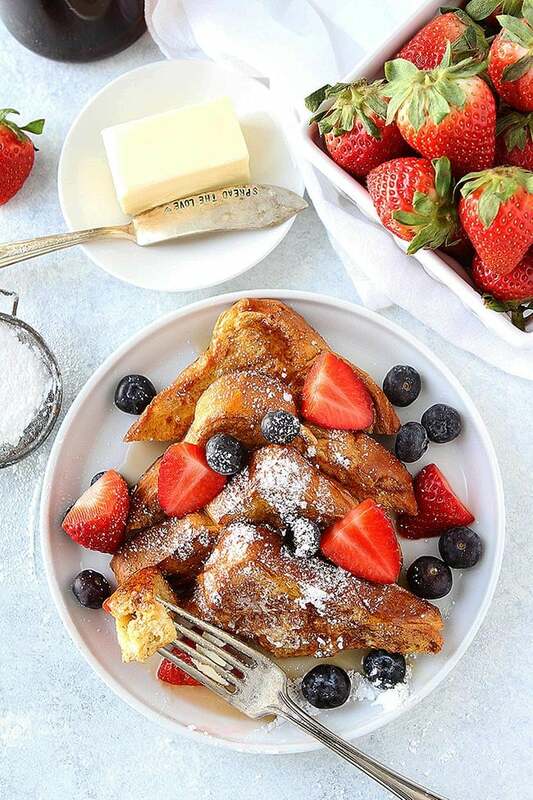 What to Serve with French Toast? See, I told you I love French toast! 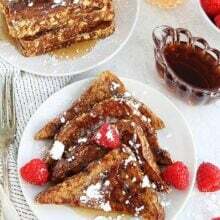 🙂 And I know you are going to love this Classic French Toast recipe, it is my absolute favorite! It is perfect in every way, it basically melts in your mouth it is so soft and fluffy. Make it this weekend for breakfast and if you can’t wait that long, make it for breakfast today! It is easy enough to make on a weekday morning too! Enjoy! This easy, light and fluffy French toast is a family favorite! Make it for breakfast today! If using an electric griddle, preheat the griddle to 350 degrees F.
In a shallow pan or pie plate, add the eggs, milk, vanilla, half of the cinnamon, and salt. Whisk until well combined. Dip each side of the bread in the egg mixture. Note-add the other half of the cinnamon after you have dipped half of your bread slices and mix again. This will make sure all of the slices get a good amount of cinnamon. Melt a little butter on the hot griddle or in a large skillet over medium heat. Cook the French toast until golden brown, about 2-3 minutes on each side. 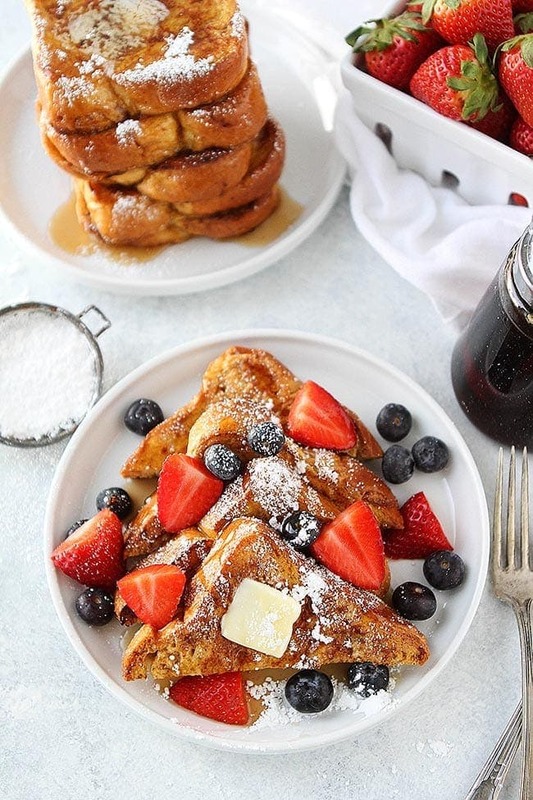 Serve the French toast warm with maple syrup, powdered sugar, and berries, if desired. Note-to keep the French toast warm, heat the oven to 200 degrees F. Place a wire rack on a large baking sheet and place the French toast on the rack. Keep warm in the oven for up to 30 minutes. This looks so delicious, love the idea of having it with bacon! I wonder how this would work with gluten free bread – definitely going to try that out. Thanks for sharing! Curtis Stone make some and dipped it in melted butter then cinnamon and sugar and topped with warmed peaches. I can positively say this is the most delicious French toast ever… it’s exactly the way I make it! Sooo good. For special occasions I do the regular drizzle of maple syrup, sprinkled with powdered sugar, then add fresh strawberries and a dollop of fresh whipped cream. Sometimes I make extra and let it cool on the wire rack, then put the cookie sheet with the wire rack into the freezer. It freezes better on the rack than it does just on the cookie sheet. When frozen they go into a freezer bag. While they’re not as good as fresh, it’s quick work to put in the toaster oven to reheat. If you plan to freeze, don’t butter them fresh off the griddle. The butter will melt in the toaster oven and it can set off the smoke alarm! It would probably drop into a regular toaster too, but I don’t have one, so I haven’t tried that. Yum!! Mornings aren’t *so* bad if french toast is involved! Some of the best french toast I’ve ever had was made with croissants. I use that as an extra special treat. We like to do that too during the holidays! 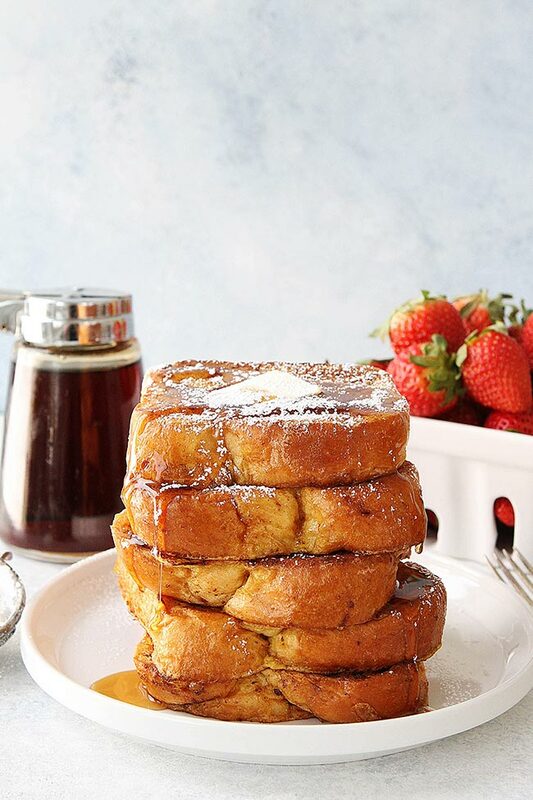 How do you make this french toast for a large crowd? You can double the recipe and see the tips about keeping it warm in the oven! Enjoy! Everything looks real yummy * I want to try them all. Thanks for the recipe! I used Texas toast and really appreciated the advice of adding the cinnamon in stages for later batches of french toast. If you put the cinnamon in a cup add cinnamon and a little bit of water, then stir with a fork then pour into the batter. The cinnamon does not sit on top of the batter. Hi, has anyone or you ever used coffee creamers when making this recipe? Yes, I have added a little vanilla coffee creamer to the milk, skipping the vanilla and sugar when I had run out of vanilla. They were very simple to make thank you. Greatly appreciated. I was in charge of making breakfast while camping in Yosemite. I used this recipe and used Trader Joe’s brioche bread. (recommended in another recipe. EVERYONE said this was the best French bread they had ever had! Even though we were camping, I did the full breakfast. Berries, real butter, maple syrup (no imitation stuff), sprinkled powdered sugar over the toast, gourmet sausage and scrambled eggs. Added a small arrangement on the table of pine sprigs, random leaves and twigs. Whatever was nearby. It made the camping trip feel very special. The group even asked me to make it again the following day. Double decadence! I’ve prepared this recipe twice now, and I love it! Today I went to 2 bakeries specifically for the brioche before I finally found it at Whole Foods, and it was worth the running around in the early morning city heat! (and I found some tiramisu gelato while I was there :). I baked thick cut crispy bacon and served it with fresh blueberries and strawberries and warm maple syrup per your recommendation. So thank you for helping me create a perfect Sunday brunch for me and my partner. I’m looking forward to making this again when fall arrives. I thought I was good at making French Toast already. I included most of these ingredients, but this weekend I followed all these steps. WOW!! Crazy delicious! I we served a little fruit compote on the side and my kids begged for the same thing for dinner!